Paul Brueske, author of The Last Siege: The Mobile Campaign, Alabama 1865, will hold a discussion and book signing at Beauvoir in Biloxi, Mississippi. The event begins at 2:30 pm. To learn more, click here. Paul Brueske, author of The Last Siege: The Mobile Campaign, Alabama 1865, will participate in Page & Palette’s First Friday Author Round UP at The Book Cellar in Fairhope, Alabama. This event begins at 6pm and is free to the public. To learn more, click here. Learn more Paul’s book, The Last Siege, on our website. John Antal, author of 7 Leadership Lessons of D-Day: Lessons from the Longest Day—June 6, 1944, will discuss his book in an interview on the Warriors for Peace radio show. The interview begins at 11am PST / 2pm EST. To listen live, click here. Learn more about John’s book, 7 Leadership Lessons of D-Day, on our website. Richard Killblane, author of The Filthy Thirteen: From the Dustbowl to Hitler’s Eagle’s Nest – The 101st Airborne’s Most Legendary Squad of Combat Paratroopers, will discuss his book in an interview on the Warriors for Peace radio show. The interview begins at 11am PST / 2pm EST. To listen live, click here. Learn more more about Richard’s book, The Filthy Thirteen, on our website. Eric Thompson, author of On Her Majesty’s Nuclear Service, will discuss his book in an interview on the Warriors for Peace radio show. The interview begins at 11am PST / 2pm EST. To listen live, click here. Learn more about Eric’s book, On Her Majesty’s Nuclear Service, on our website. Paul Brueske, author of The Last Siege: The Mobile Campaign, Alabama 1865, will be signing copies of his book at the Outdoor Market at Five Rivers State Park in Spanish Fort, Alabama. Paul Brueske, author of The Last Siege: The Mobile Campaign, Alabama 1865, will attend the Pensacola Civil War Roundtable at O’Charley’s Restaurant, Davis Hwy in Pensacola, Florida. This event begins at 7pm and is open to the public. Janet Croon, author of Savas Beatie’s The War Outside My Window: The Civil War Diary of LeRoy Wiley Gresham, 1860-1865, will discuss her book in an interview on the Warriors for Peace radio show. The interview begins at 11am PST / 2pm EST. To listen live, click here. Learn more about Janet’s book, The War Outside My Window, on our website. Celia Straus, author of Hidden Battles on Unseen Fronts: Stories of American Soldiers with Traumatic Brain Injury and PTSD, will discuss her book in an interview on the Warriors for Peace radio show. The interview begins at 11am PST / 2pm EST. To listen live, click here. 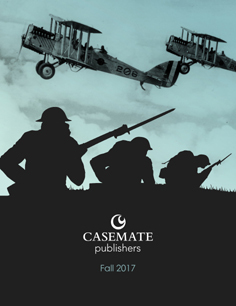 Learn more about Celia’s book, Hidden Battles on Unseen Fronts, on our website. Robert Dumont & Joe Parnar, authors of SOG Medic: Stories from Vietnam and Over the Fence, will sign copies of their book at the Special Operations Association Reunion (SOAR) at The Orleans Hotel and Casino in Las Vegas, Nevada. The vendors’ hall is open to the public the morning of October 18th only. To learn more, click here. Learn more about Robert & Joe’s book, SOG Medic, on our website. Jessica Goodell, author of Shade It Black: Death and After in Iraq, will discuss her book in an interview on the Warriors for Peace radio show. The interview begins at 11am PST / 2pm EST. To listen live, click here. Learn more about Jessica’s book, Shade It Black, on our website. Paul Brueske, author of The Last Siege: The Mobile Campaign, Alabama 1865, will discuss his book at the November Meeting of the Twin Cities Civil War Roundtable in Bloomington, Minnesota. To learn more and register, click here.